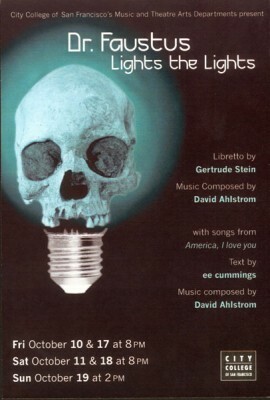 In two weeks, I will be singing Mephistopheles in the staged premiere of David Ahlstrom’s opera Doctor Faustus Lights the Lights, on a libretto by Gertrude Stein. This is a production of City College of San Francisco‘s Music and Theatre Arts departments. David Parr will direct and Michael Shahani will conduct. This is a 50-minute opera in three acts that envisions Faust as Thomas Edison. Here, Faust has sold his soul to invent the electric light. Mephistopheles, the Prince of Darkness, is not happy with this turn of events, but finds that he has limited options available in this deal gone wrong. This is a tenor devil, after all, not the traditional baritone or bass devil. The second act includes a Very Grand Ballet of Lights. With this subject matter, this is an opera very appropriate for the San Francisco and Silicon Valley areas. Richard Scheinin and others have written about lack of melody in contemporary opera. This opera does not fall into the all-too-common trap of having most of the vocal music written in a recitative style. Instead it is full of melodies, often quite upbeat and jaunty, so it is very possible you will leave humming at least one of the tunes. Rounding out the program are songs from another Ahlstrom work, America, I love you on texts by e. e. cummings. Performances are Friday, October 10 and 17 at 8:00 pm; Saturday, October 11 and 18 at 8:00 pm, and Sunday, October 19 at 2:00 pm. All performances are at the Diego Rivera Theatre at Phelan and Judson at City College of San Francisco’s Ocean campus. General admission tickets are $15, or $10 for students and seniors. Call (415) 239-3100 for reservations and more information. Rats: I found this a year too late. How did you/ccsf happen to find the Ahlstrom score, and was there a recording or dvd, and are any other such performances (ahlstrom, stein) planned in the future? I don't know about any other future performance plans, but I hope so!